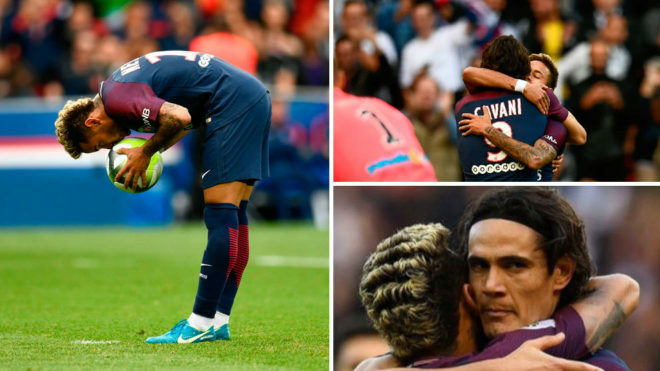 The penalty debate at Paris Saint-Germain appears to be at an end after Neymar took and scored one against Bordeaux and was congratulated by Edinson Cavani after doing so. Both hit the headlines for the recent argument which engulfed them relating to who took a spot kick against Lyon. The big moment against Bordeaux arrived after 40 minutes when PSG were awarded a penalty at a time when both forwards had already scored a goal apiece. With the eyes of the world watching, the Brazilian placed the ball on the spot without a claim or complaint from Cavani and tucked away the penalty. Upon celebrating, Neymar turned to the Uruguayan and in a gesture which seemed premeditated, hugged and thanked him for the chance. Cavani accepted the embrace from his teammate, although his facial expression may have betrayed his true feelings on the matter.